We had no clue, when we exuberantly walked through the doors of the MTC almost 17 months ago (but who's counting?) that we were in for a life-changing experience. There is no way to adequately put into words what we have experienced while we have served our mission in Romania. Having never met Mother Teresa, we feel fortunate that we have met others like her and we have been inspired and moved beyond words. 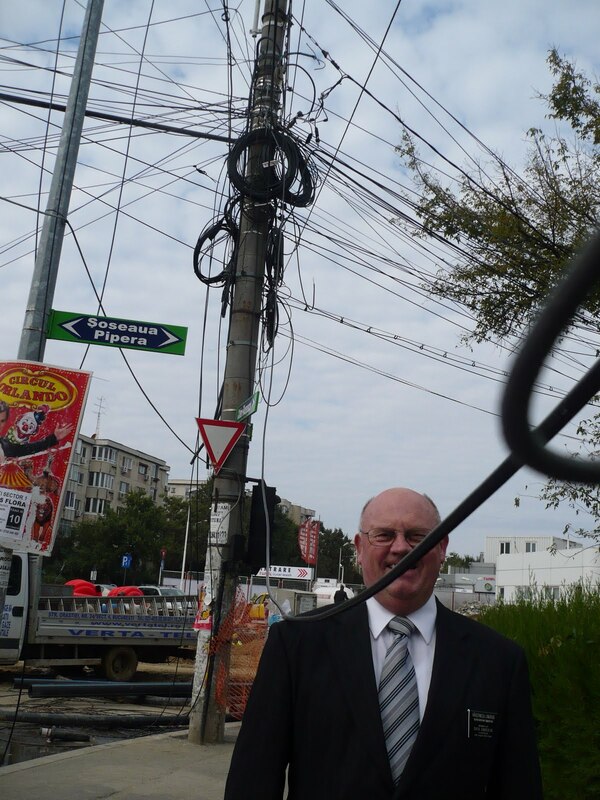 This week we ventured to Slobozia, a small town in southeast Romania. We had been told of a wonderful foundation and a director who had devoted her life to helping the poor, the dying, the neglected, and the disabled. 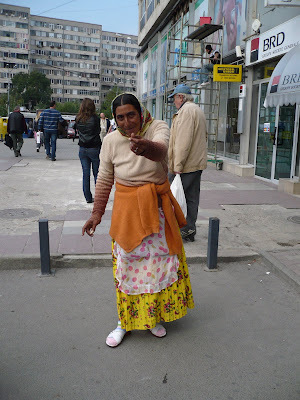 Before our mission ended, we wanted to meet this woman and possibly fit in one more project. Little did we know that the trip would be our greatest travel trial we would endure. The first train left Bucharest at 5:15 a.m. The train was decent but it had been sitting at the station all night in below freezing temperatures and the chill never left the air (or the seats we were sitting in) for the first 2 hours of the trip. We had to change trains in the middle of nowhere and that required a 30-minute wait standing outside on an icy platform since there was no train station. The temperature was 10 degrees. Finally, the train lumbered in and we excitedly climbed the 2' step. This was what the locals call the "P" train. It connects villages and is the cheapest and only form of transportation for the common folk. We have seen these trains before. In the summer, they are hot and crowded and you will see people literally hanging out the windows just to get some moving air. In the winter, it is different. There is no heat and people sit stoically, bundled up as if they were riding a chair lift. We endured this for more than an hour before we reached our destination. We couldn't feel our feet. We asked someone to take our picture and even managed to smile! Pictures never do justice! The seats were Naugahyde and the windows were completed frosted over, on the inside! We finally got to our destination and unloaded onto more frozen turf. Next came a 2-hour white-knuckle car ride which was arranged so we could visit yet another foundation. Five of us were crammed into a Dacia, a Romanian version of a Gio (only not so luxurious!) All we can say is that we lived to tell! This is Lina. She is a fireball who began a foundation to aid autistic children. We were impressed with her dedication and will write a project that will provide play equipment to be used if the snow ever melts. Imagine monkey bars and swings. Lina began this foundation when her own son (right) was diagnosed with autism. This is the only facility for autistic children in the area. We posed with the other care-givers before we said good-bye. Back in the car . . . When we finally arrived to meet Noreen O'Gorman, we had been going at it for 12 hours. As we talked, we realized she had also put in a day more exhausting then ours. She started a foundation to rescue and care for terribly disabled children. She is an RN from London and has devoted her life to these children and also travels to the surrounding villages offering assistance in a home health program. As we visited, we watched in awe as Noreen interacted with the children. They love her. . .
. . .and she loves them. Each one received hugs and kisses. By now it was 6:30 and time for dinner. Noreen whips up blended soups and other delights in this cracked blender. It is on the project list to be replaced. At 8:30 pm we met Noreen for dinner in our hotel. She is an amazing woman and we totally enjoyed becoming acquainted with her. We collapsed in our hotel at 10:30 and she went back to her center where she did the nightly rounds and slept in her office so she would not have to use precious funds to hire a night nurse. She is amazing! The next morning we decided to scrap the return train and take a bus back to Bucharest. It was a step up (if you would call a 15 passenger bus with 21 people, UP!) We stopped 13 times and the trip took 2 & 1/2 hours. At least it was warm! This weekend we will write two projects. We've finally reached our fill of train excitement and we're pretty sure we can fill the remaining 6 weeks (but who's counting?) of our mission staying close to home. As we continue our free-fall to the end of our mission, we have days when we "well-up" with the thought of leaving Romania and this mission that we have loved so much. To deactivate those emotions, we sometimes mutter about the things we WON'T miss. For our blog followers who have experience living in a foreign country, you realize "It's not Kansas, Dorothy"! Lest you think we're being negative, think again. We call it 'therapy'! Stepping off a bus into six inches of slush containing whoknowswhat! Our "Easy Bake" oven. If it weren't for Denny, we would call it our "Easy Burn" oven! Not being able to help everybody. Water problems. Sometimes it's hot, sometimes it's cold, sometimes it's brown, sometimes it's off! ...with the classy gym equipment! Just look at the muscles! My companion lights up my life but I'm pretty sure I'll be ready for a transfer soon! Being from the Northwest, we thought we knew grey! Now that we are seasoned Bucharestites, we are sure there can be nothing grey-er than Bucharest in winter. The sooty block buildings, the greasy streets, the grimy cars, the mucky sidewalks, not to mention the cloudy sky, all combine together to produce a colorless view out our window. There's a newborn baby in the apartment just below ours and when we hear the wailing cry, we are reminded that life is good and there's no time for melancholy. 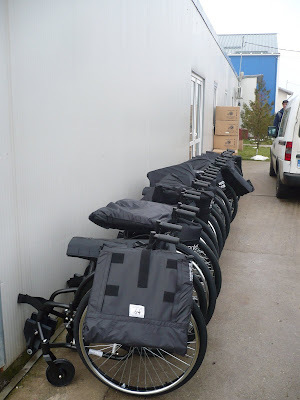 Our work continues and in the past week we met with two NGO's to officially sign donation agreements that will bring another 650 wheelchairs into Romania this spring. We also did something we have wanted to do our entire mission...attend a concert in the beautiful Athenium. We gathered all the senior couples together and had a wonderful time forgetting all there is to do! This lady didn't get the memo about spring being right around the corner! 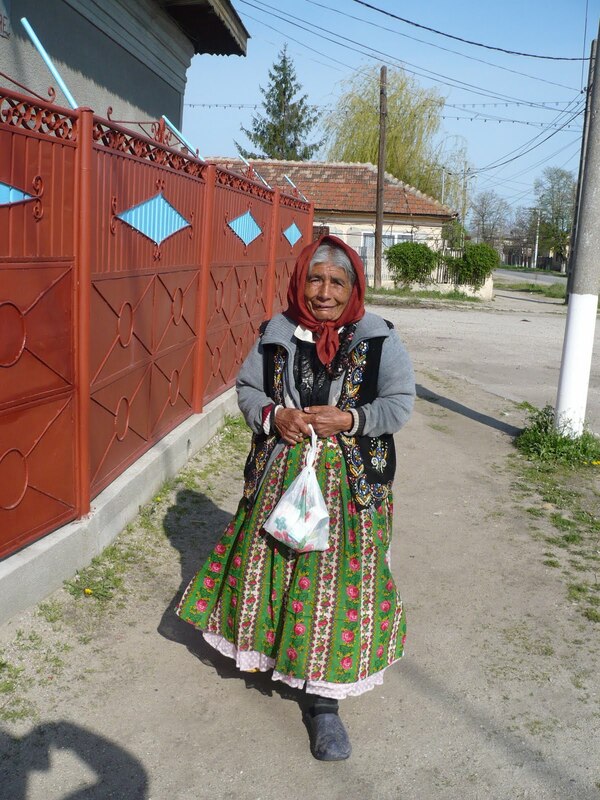 Romanians have a hard time smiling, even when you ask them to! Sometimes when I see these faces, I hum to myself the song, "Smile through your heart is breaking, smile even though you're aching, while there are clouds in the sky, you'll get by...." It makes me smile, anyway! This is the Athenium. It was built in 1888 and it is a European masterpiece. We snapped this picture right inside the gorgeous lobby. L to R: President and Sora Lundberg (SLC), Elder and Sora Linerud (Spokane), Elder and Sora Van Orman (Provo), Elder and Sora Dummar (Heber). The Athenium underwent a total restoration immediately after the revolution. Later in the week we traveled to a wheelchair partner, Motivation Romania to inspect the shipment of 370 wheelchairs that had just arrived. Each wheelchair has some assembly involved and we watched while these employees masterfully worked to assemble them. 15 down, 355 to go! And now for the highlight of the week! If you ask a missionary a fast food they miss most from home, the first answer is always, "Subway"! We have McDonalds, KFC, and BurgerKing but we don't have a Subway! For our District meeting lunch, we made hats (I downloaded the logo and just printed it!) 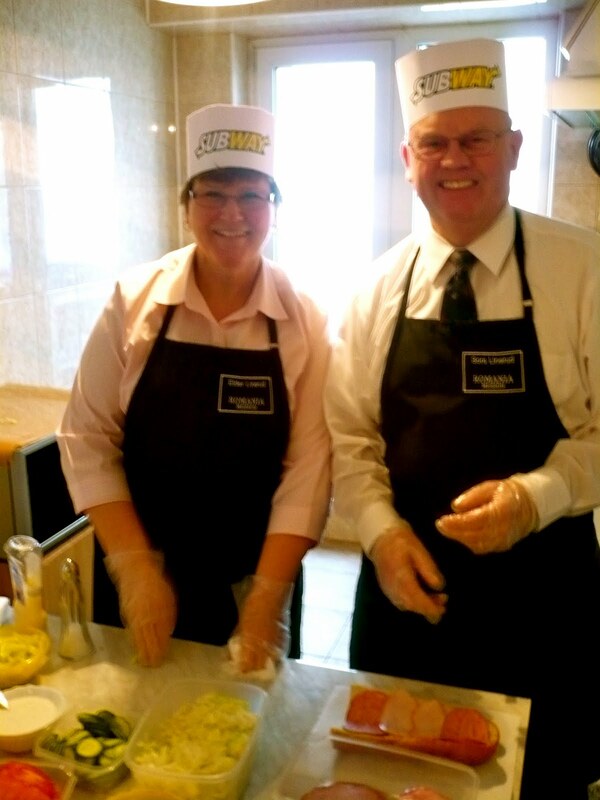 and reconstructed a Subway shop right in our kitchen! As you can see, we covered every detail, right down to the gloves, wrapping in paper and stuffing the footlong into a plastic bag. 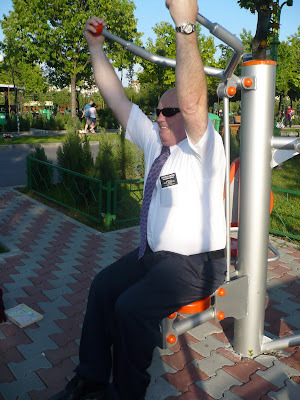 The missionaries loved our idea and we had a blast pulling it off! We are going to have to work on a soda pop dispenser with free refills but we have to leave some ideas for the new couple replacing us in 57 days (but who's counting?)! 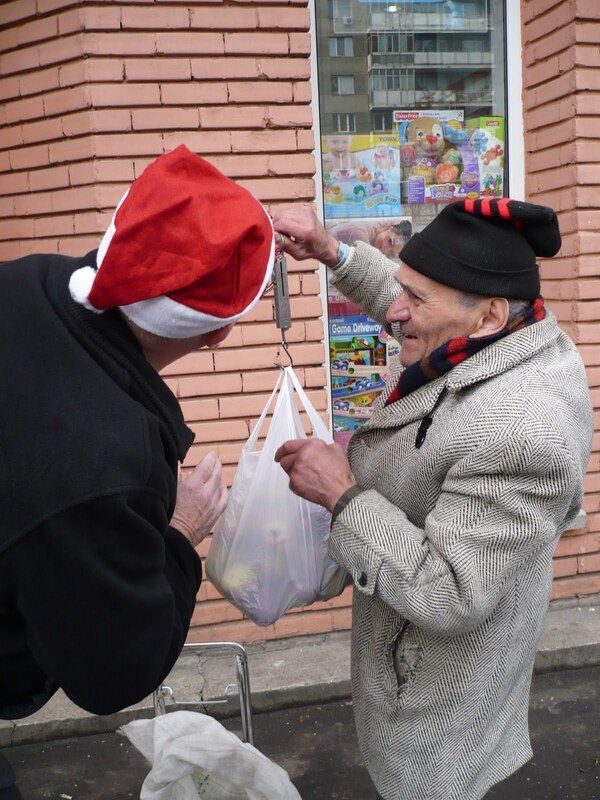 Last year on Christmas Eve we decided to give cash to unsuspecting Romanians who appeared to us as needy. Our only rule was that the receivers could not be beggars. Our beneficiaries would be ordinary people we came upon while walking down the streets of our neighborhood. The unbelieving smiles and thanks we got warmed our hearts. This year, we wanted to expand our giving so we came up with a brilliant idea. 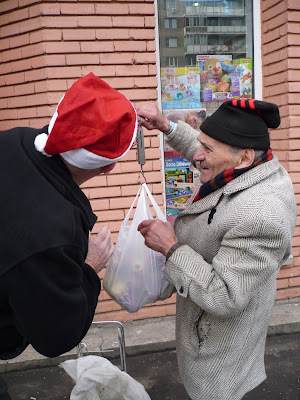 We would buy the meager goods from one street vendor and give to other people we met who looked like they could use some Christmas cheer. I snapped pictures along the way. The Romanian elderly have been hit hard by the economy and, in a recent decision by the government, their pensions were cut by 25%. Many have taken to the streets, selling fruits and vegetables they raise themselves. 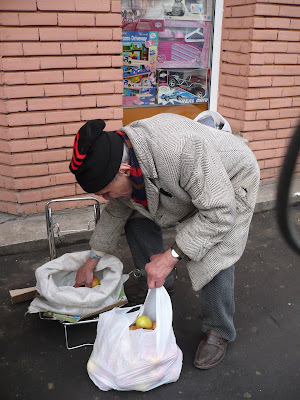 This little man stood by his meager bag of apples, hoping someone would buy one or two. Elder Linerud asked him to put some apples in the bag we provided and then the little man would look up to get the sign to stop. Elder Linerud motioned for all of them! You can feel his delight! The little scale said we owed 12 lei--$4. 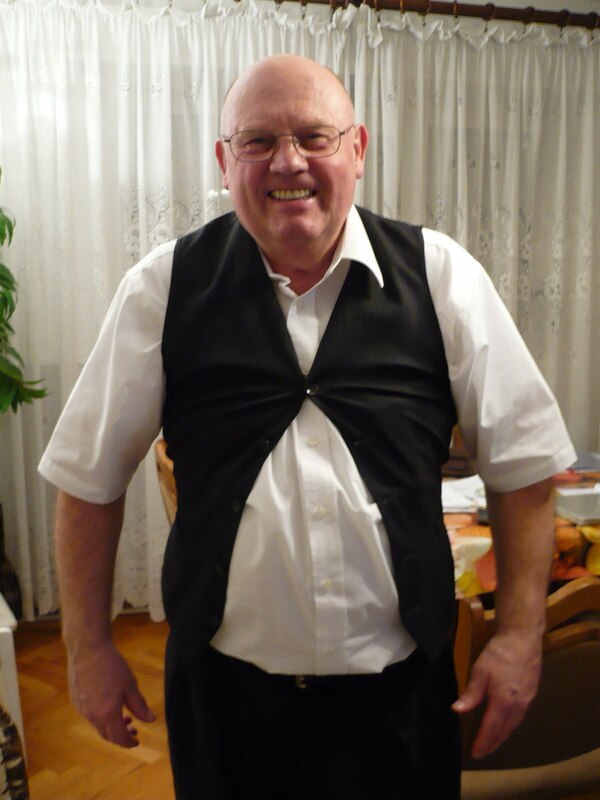 Elder Linerud tipped him another 10 lei. He shook Denny's hand and kissed mine and said "Multimesc!" (I thank you!) about ten times! He then gathered up his empty bag and went home for Christmas. Onward. We found this man, gathering "things" from the street. He was dumbfounded that he would get something from a stranger. 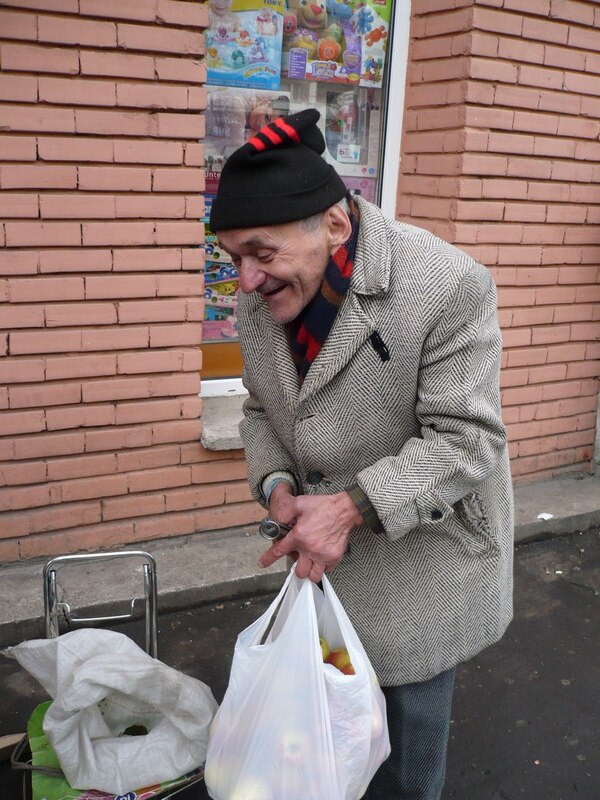 We gave three or four apples at a time and everyone returned our gift with a smile. These people are waiting for a handout from the other people who are waiting in line to buy pastries. As the "rich" people exit the pastry shop, the "poor" ask for some of their goods. This is a common sight at the doors of a grocery store, as well. As you can see, Elder Linerud was very popular! We hope the people in line took note and reacted with some "giving" of their own. We are trying to be good examples in a dog-eat-dog culture. There are generous Romanians but too few of them. This man is our neighborhood schizophrenic. We have named him "Skirt Man" as he always dresses like this, carrying a purse and a doll. He appreciated the apples. When the apples were gone, we did the same thing with a load of carrots. We had a blast! This "look" made our Christmas giving complete. Next year on Christmas Eve, our challenge is to come up with something as meaningful to do for the down-hearted people of Spokane. Our mission has changed us and we will not be found buying last-minute Christmas gifts!